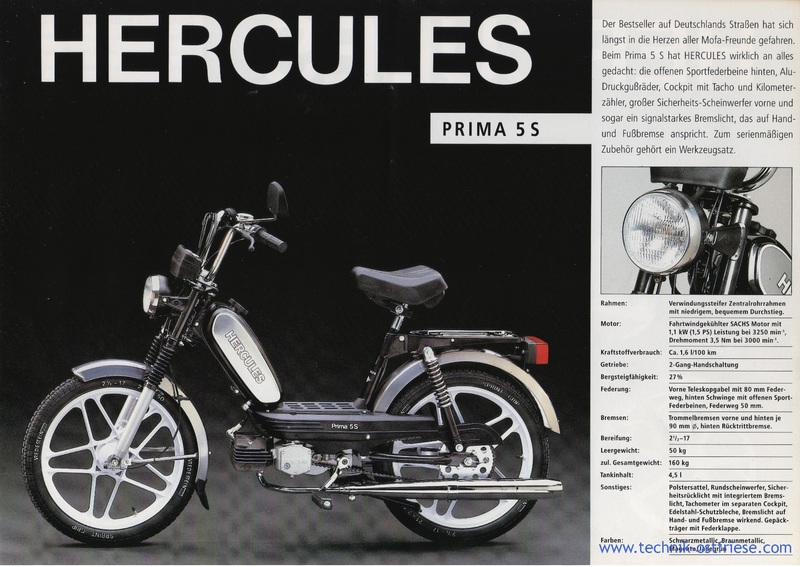 Welcome to Hercules mopeds, made in Germany by Nürnberger Hercules-Werke Gmbh, D-8500 Nurnberg Deutschland. 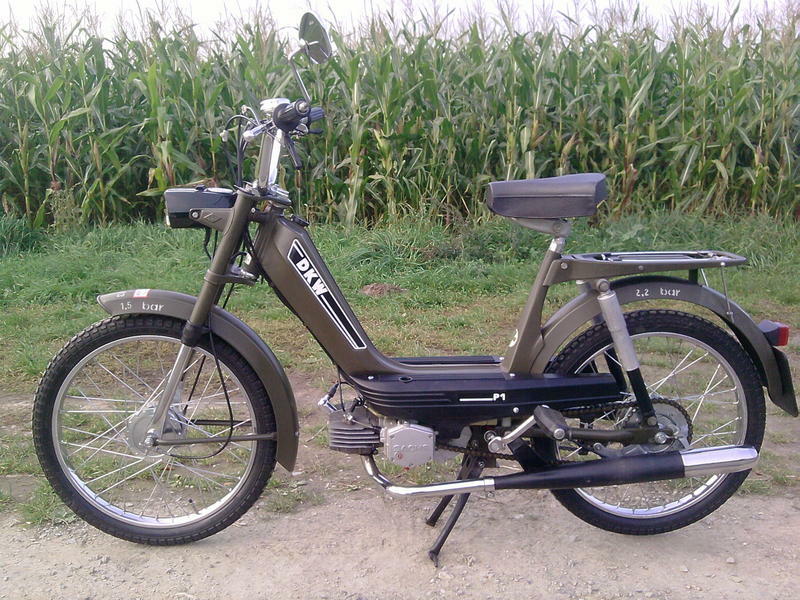 Other German-made US-model mopeds are Kreidler, Kynast (Flying Dutchman), Solo (Odyssey). 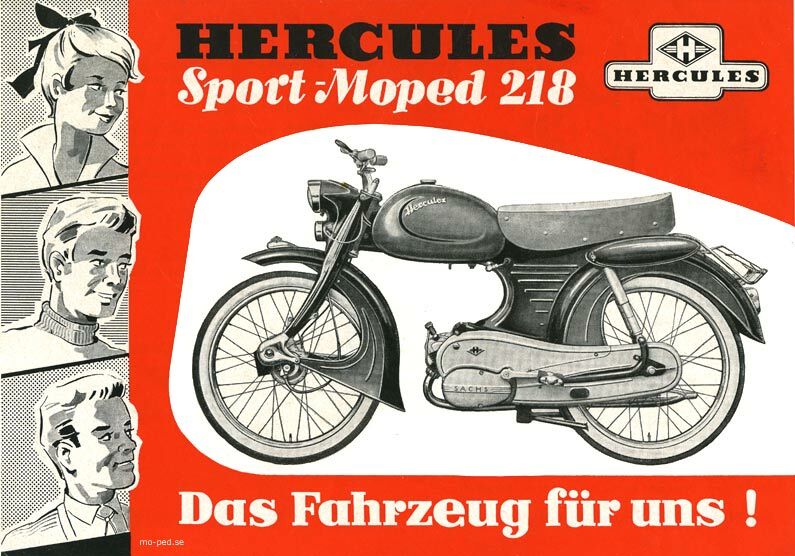 Hercules mopeds have several brand names. In Europe they are called Hercules or DKW or Zweirad Union, in the USA they are known as Sachs, and in Canada and northern USA they are branded as Eagle. 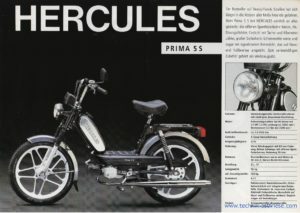 There are likely other brands of Hercules mopeds worldwide. 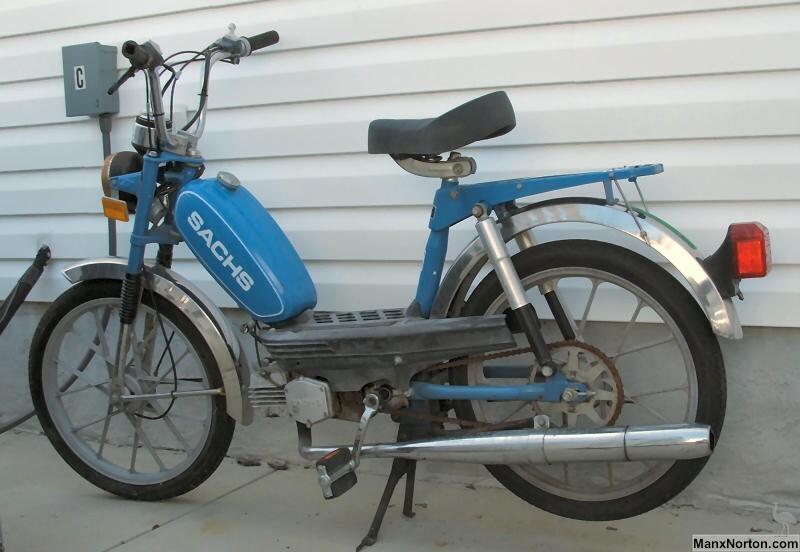 Hercules-made mopeds all have Sachs engines, made in Germany by Fichtel + Sachs AG, D-8720 Schweinfurt Deutschland. The Sachs brand mopeds, sold in the USA, all had Sachs 504/1 or 505/1 one-speed automatic engines. 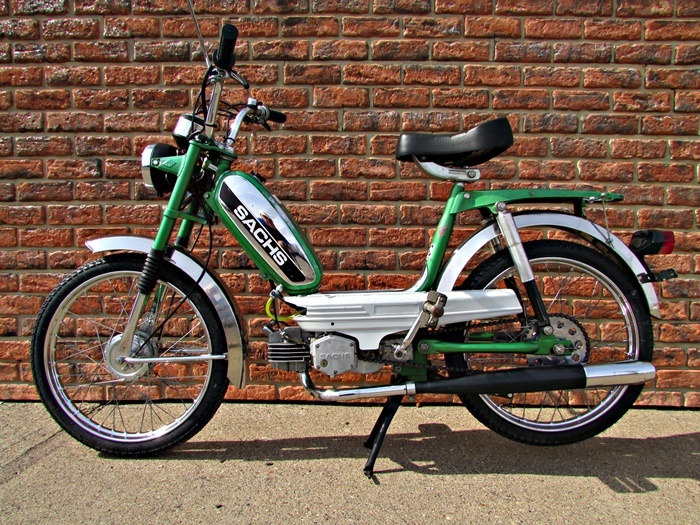 The Eagle brand all had Sachs 505/1, with the Sachs logos removed to conceal the identity. 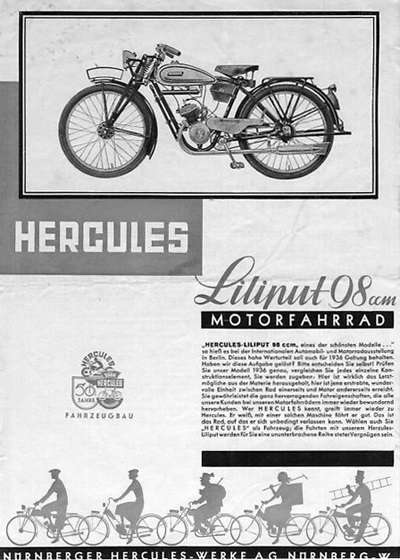 Hercules made motorcycles since 1903, cyclemotors, mopeds, scooters, and cars. 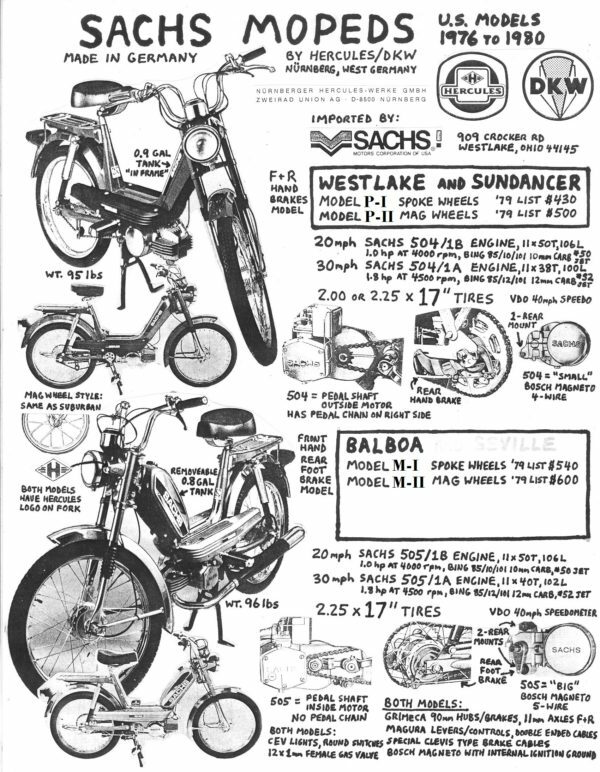 The main focus in the early 1900’s was on motorcycles with small capacity engines. They began to increase to larger machines in the thirties and even saw some competition and long distance endurance success. They made various commercial vehicles between 1905 and 1928. In 1932, when tax reductions made 3-wheeler cars profitable, they made the Hercules Coupe, powered by a 200cc ILO engine. It was only in production for one year. 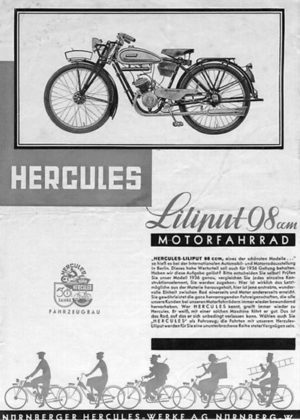 Hercules and Sachs: The partnership of Hercules and Sachs began as early as 1905, when Ernst Sachs invented the Torpedo brake hub which provided a revolution in bicycle manufacture – and in bicycle sales. 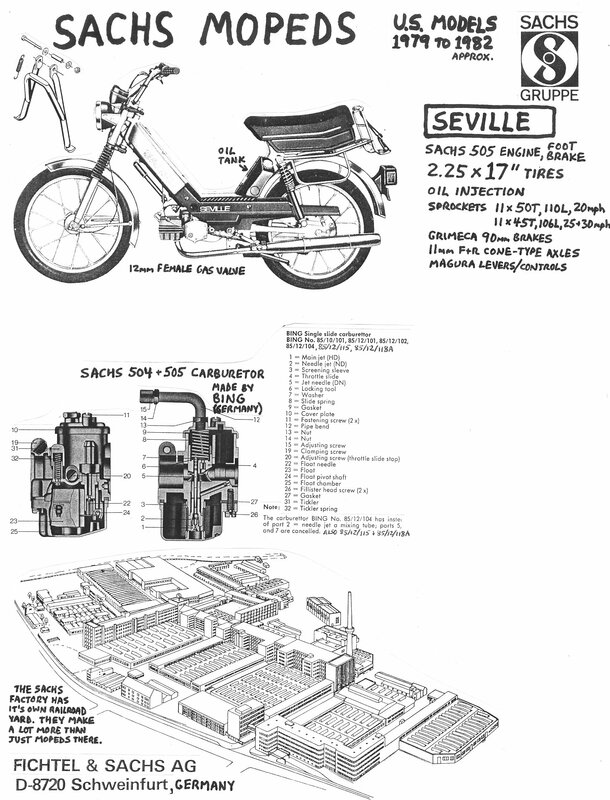 Hercules involvement with Sachs led to the development of a very refined moped engine just before WW2. With the declaration of war in 1939, there had been no time to develop this ‘Saxonette’ further. 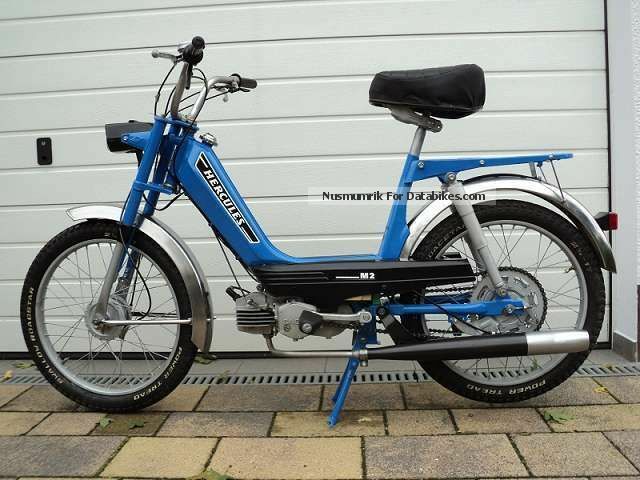 But DKW engineers re-designed it during the war. Their plans were impounded by the British after the war, and led to the arrival of the Cyclemaster, a rear wheel and engine unit for bicycles. 1. Mofas are 25 km/h (16 mph), no licence required, minimum age 15, no passengers. 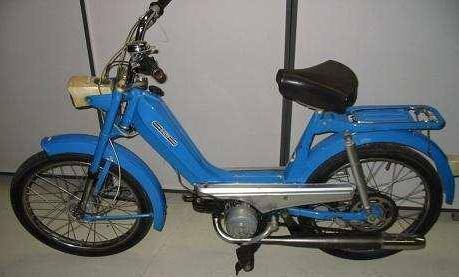 “Mofa” is short for motorisertes fahrrad (motorized bicycle). 2. 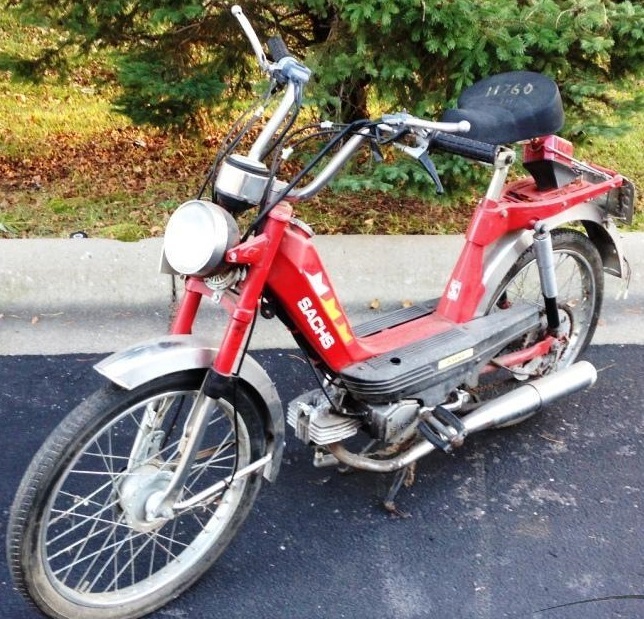 Mopeds are 40 km/h (26 mph), drivers license required (any class), minimum age 16. 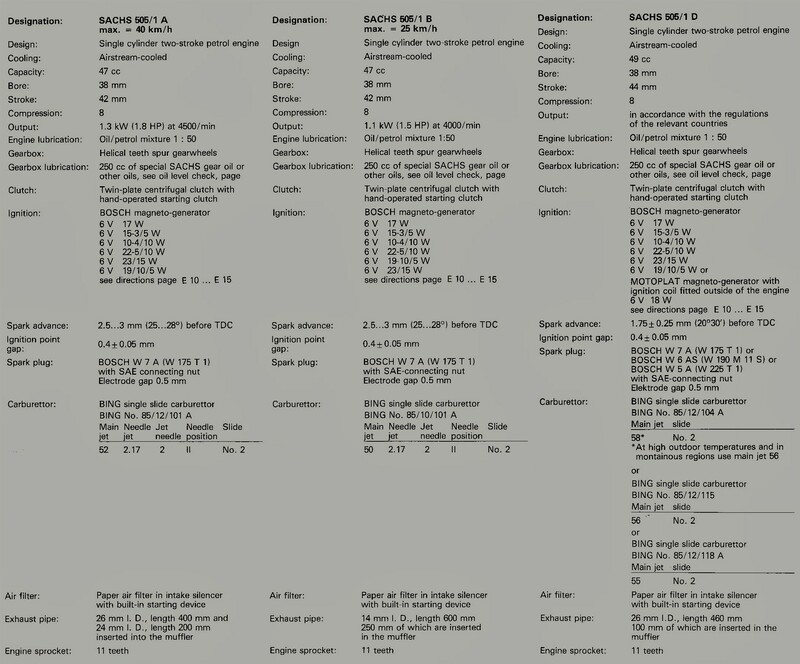 This is why Sachs 504 and 505 engine cylinders say “40km” or “25km”. The model numbers are confusing. Here is the explanation. 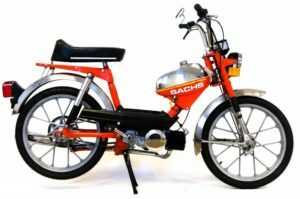 These models all have stamped sheet-metal frames with Sachs 504/1 engines. 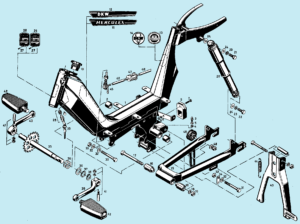 The pedals are part of the frame. There are two chains, motor and pedal. 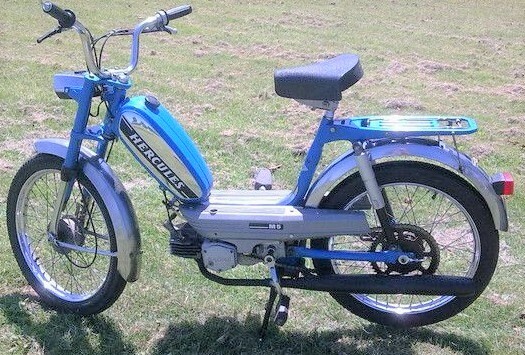 This says in 1975 the US model of Hercules sheet-frame had a 504/1BS engine, 1 hp 20mph. The Canada model had a 504/1A engine 1.8 hp 25-30mph. The two 1976 models shown below agree with that. 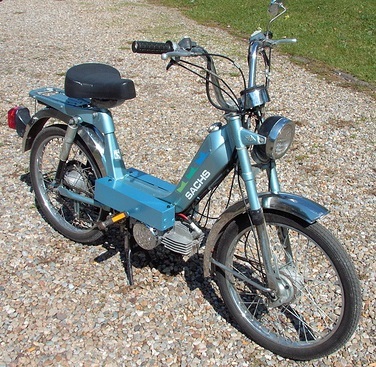 The 1975-76 USA model was branded “Hercules” but the Canada model was called “Moppett”. 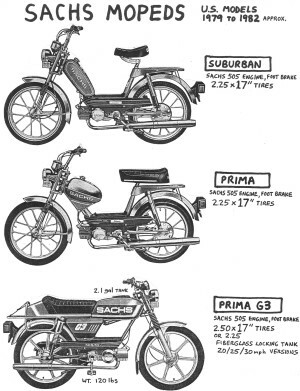 These models all have tube frames with Sachs 505/1 engines. The pedals are part of the engine. There is one chain. 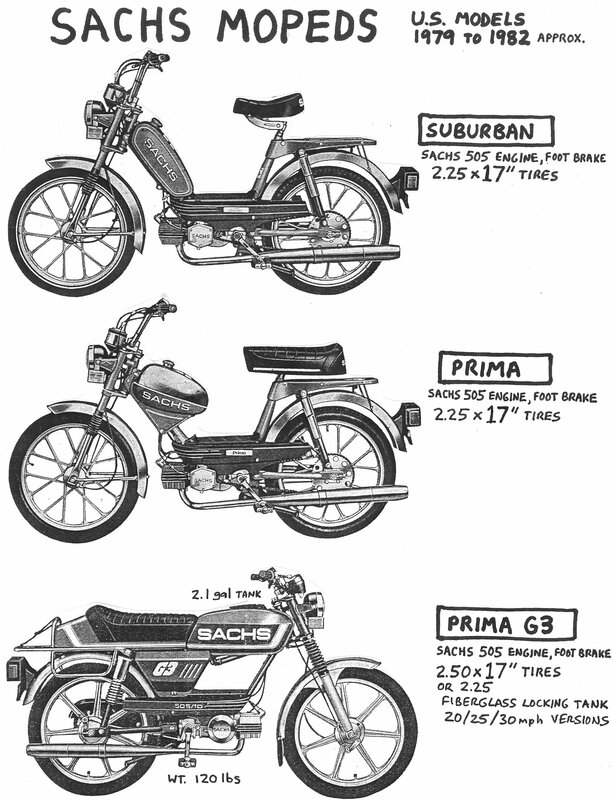 In 1976 the US DOT adopted new standards for mopeds. US states chose their on speed limits. 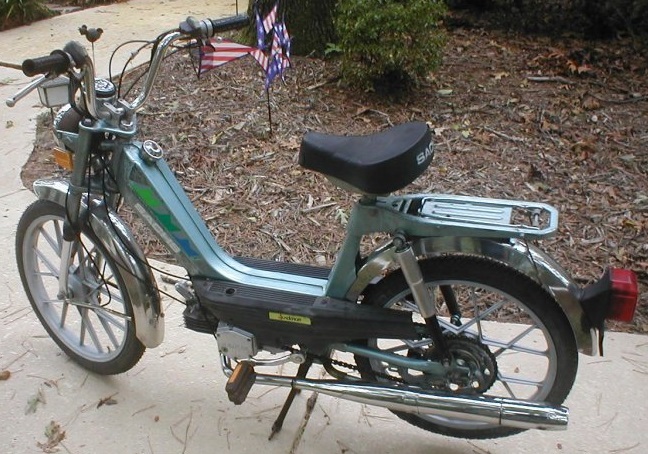 In 1977 Hercules mopeds were imported to the US in 20mph (25km motor) and 25/30mph (40km motor) versions. The 30mph states sold the 25mph versions. In the July 1977 book “Complete Book of Mopeds” it says “Just beginning to be brought into the United States, the German made line of mopeds called Hercules uses the well respected Sachs engine. Four models are presently available in the United States.” It goes on to describe the four models, 3 tube-frame-single-chain and 1 sheet-frame-dual-chain. M4 with chrome gas tank. HR2, an M4 with chrome crash bars, high exhaust pipe. An M4 variant economy model, less chrome, and a P1 sheet frame. Those other models are not in any internet images, so they did not sell much, if at all. 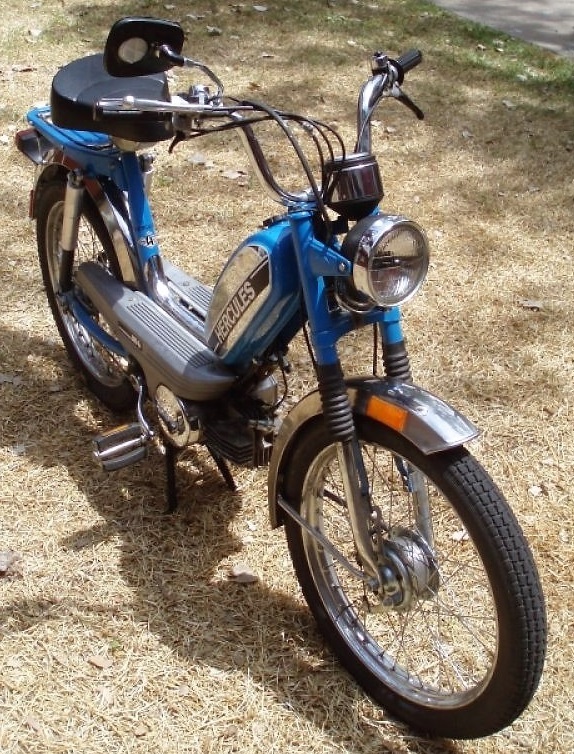 The majority of 1977 Hercules for sale in the US were M4, in several flavors. 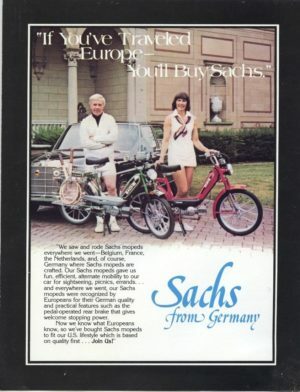 In 1977 the importer was Sachs Motor Corporation of USA, headquartered at 909 Crocker Rd, Westlake OH 44145, and later at 6401 Regio St, Buena Park CA 90620. But the bikes were not called Sachs until late 1978. This flyer discloses the true identities. The Westlake is a P1 model and the Balboa is a M4 model. 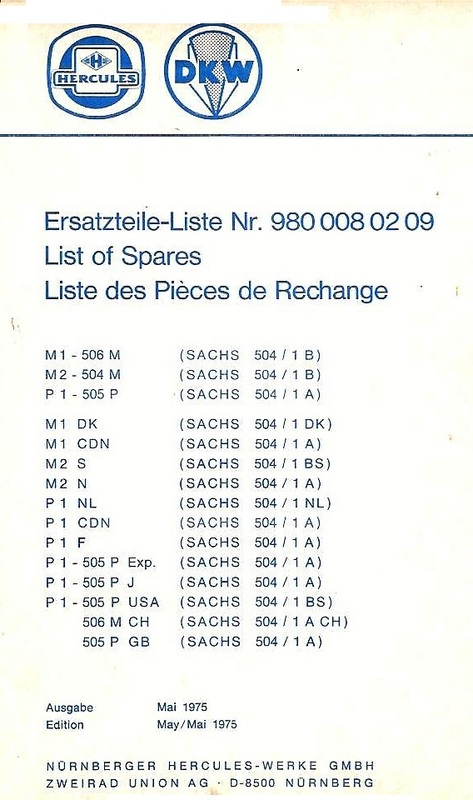 In 1978 the US models were given American names. The P-I (P1) with stamped sheet frame was called Westlake, after the town of Westlake Ohio where Sachs USA was headquartered. The engine covers changed from grey to black. 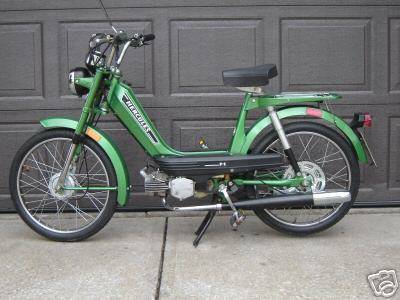 The M-I (M4) with tube frame and separate gas tank was called Balboa, after Balboa Island and Balboa Peninsula, in Newport Beach California. 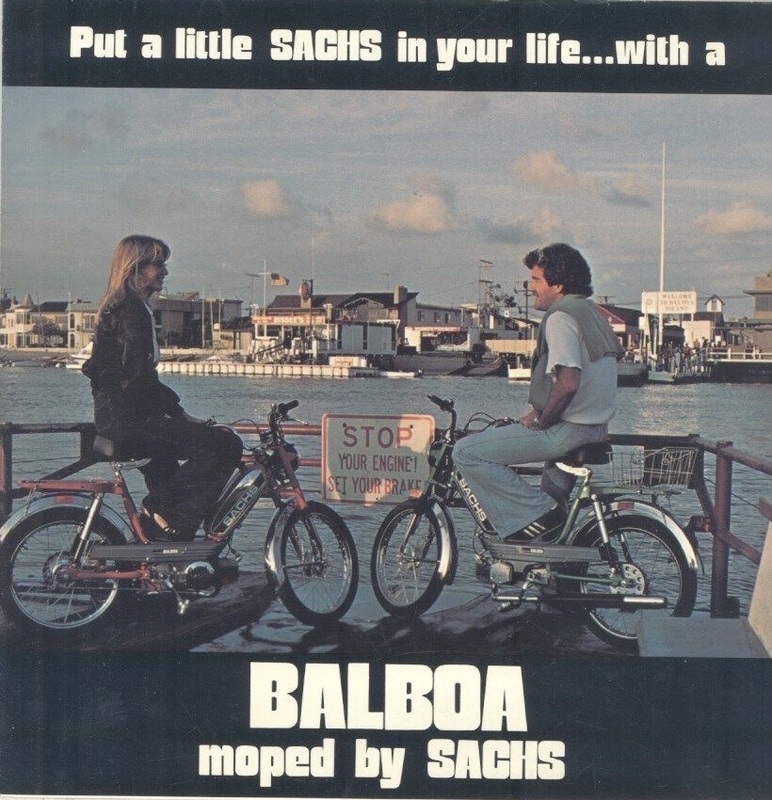 Here is a Sachs Balboa ad showing the historic Balboa Island Ferry that holds three cars and crosses the Newport Harbor channel every five or ten minutes. Myrons Mopeds had several group rides where 30 or 40 mopeds crammed onto that 3-auto ferry. Each bike paid 25¢ for the thrill of floatation. United Moped was located in Fountain Valley, near Newport Beach. 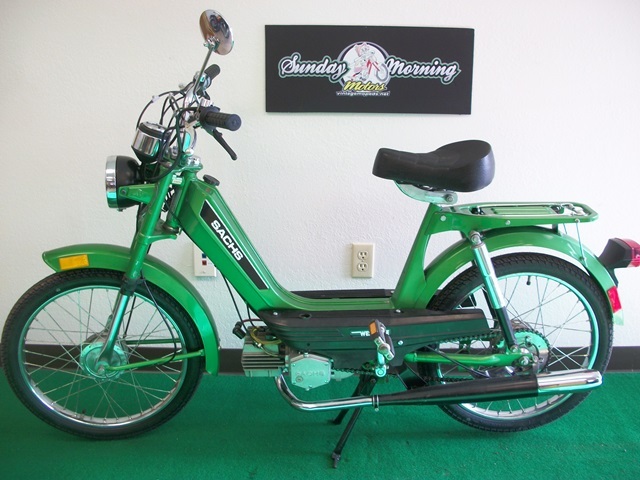 They were also the US distributor for Foxi mopeds, both Sparta made in Holland, and KTM made in Austria. 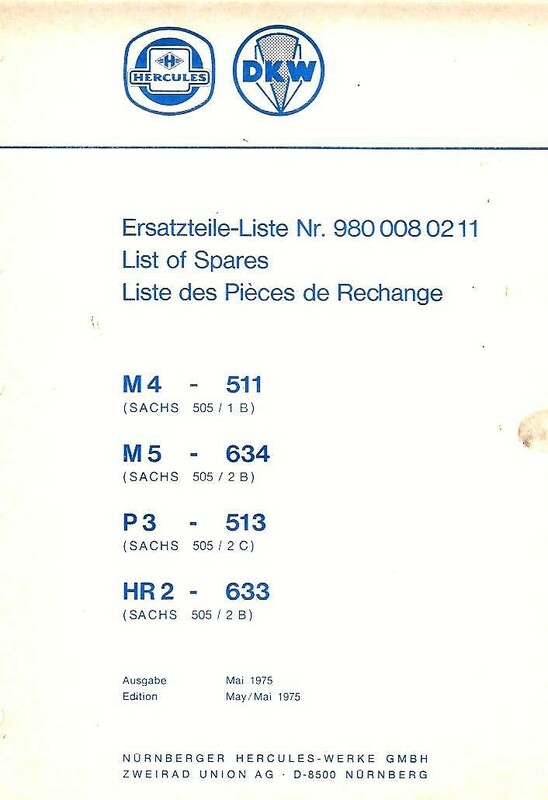 In December 1978, United Moped sent out this Sachs dealer price list to it’s dealers, who were already selling Foxi mopeds, both Sparta and KTM types. 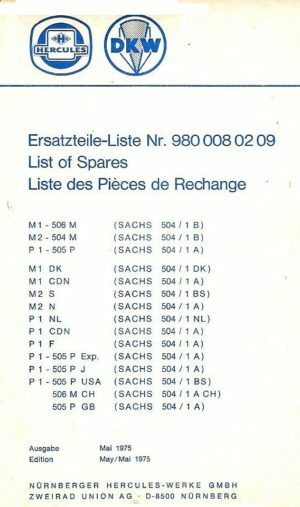 The list shows the official model names. The Westlake (Hercules P1) was either P-I with spoke wheels or P-II with “snowflake” mag wheels. 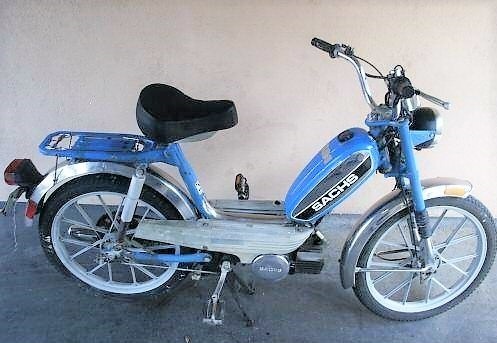 The Balboa (Hercules M4) was either M-I with spoke wheels or M-II with mags. In 1980 the Westlake was re-named Sundancer. The engine covers remained black. The tail light changed from ULO to CEV. The exhaust changed from black to all chrome. The CEV round chrome switches changed to CEV black plastic. 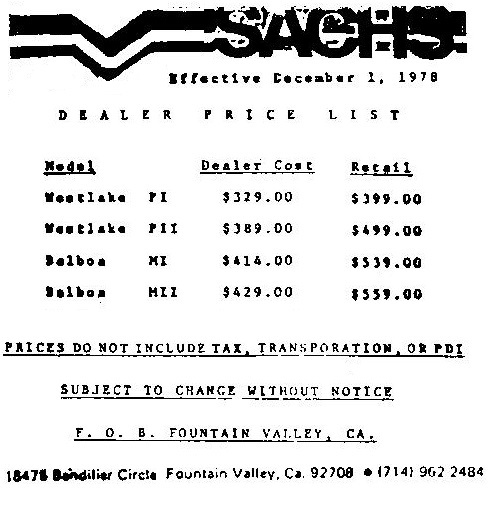 In 1979 the Balboa M-II with mags was re-named Suburban. The tail light changed from ULO to CEV. The engine covers changed from grey to black. The exhaust changed from black to all chrome. The CEV round chrome switches changed to CEV black plastic. 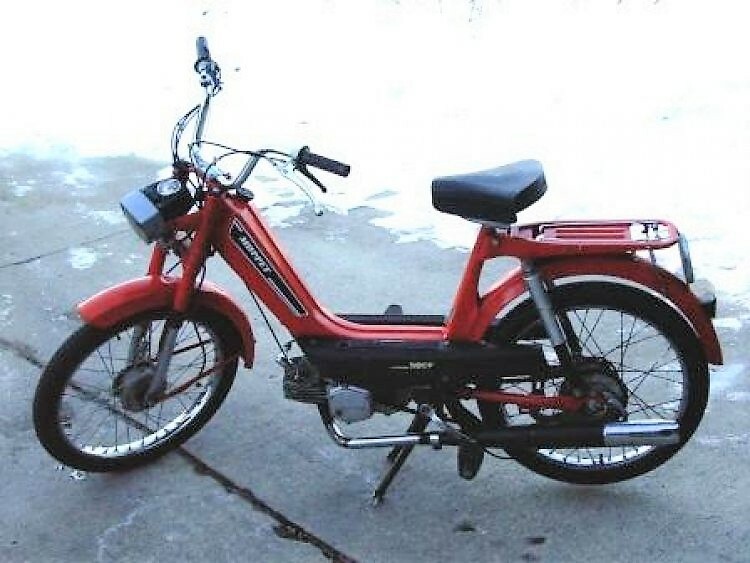 After 1980 new requirements for moped manufacturers came into effect. Motor vehicle manufacturers worldwide were required to be registered, and to have a manufacturer code which is the first 3 digits of the new 17-digit Vehicle Identification Number. Many other requirements for noise, safety, and labeling came into effect. Decreasing sales and increasing regulations drove most European moped manufacturers out of the US after 1980. They stockpiled 2 or 3 years worth of 1980 models. Shaun’s dad’s shop Royal Cyclery sold 1980 Sachs Sundancers from 1981 to 1984. The same thing happened for the other makes. They all avoided making 1981, 82, 83 models. Moped shops throughout the USA sold 1980 models mostly, during 1981, 82 and 83. 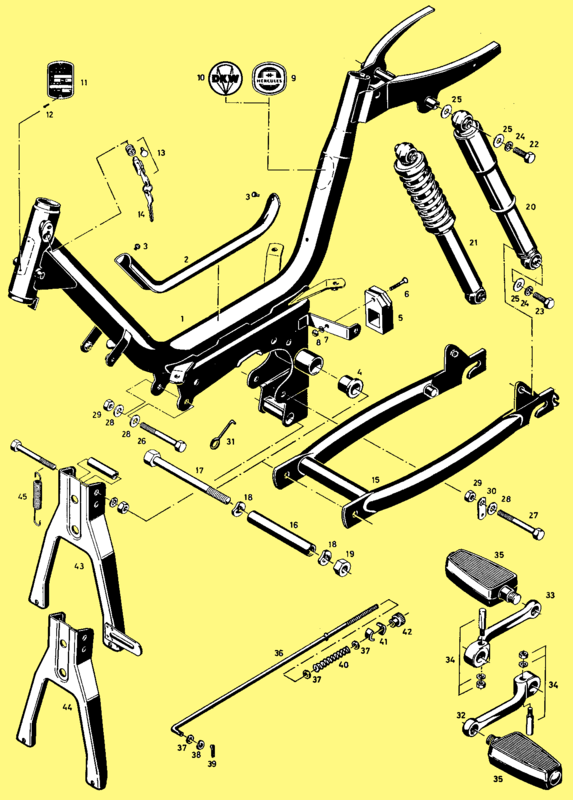 Somehow Bombardier, in Canada, had Hercules make the bikes anonymously, for just one year, maybe a single batch. The H logo is still on the gas cap and the headlight brackets. 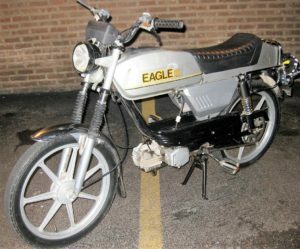 The Eagle owners manual is available online http://projectmopedmanual.info/Manual_HTML/sachs.html but it does not say the actual manufacturer or representative. It only says it was printed in Canada. 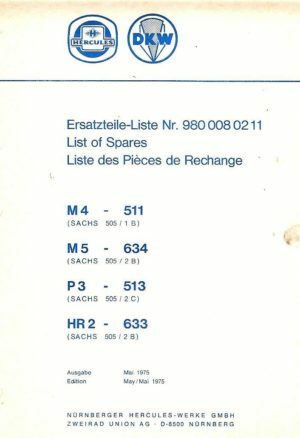 The blank ID plate shown has both English and French language, so it is Canada compliant at least, and maybe also USA compliant. Many of these bikes were sold in the Great Lakes states Minnesota, Wisconsin, Illinois, Michigan. But none or almost none were in California. So Eagles are anonymous and regional. 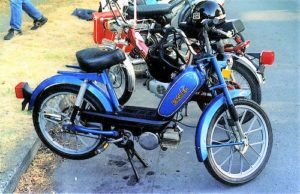 The 1980’s: While the last production year for US-model Hercules mopeds was 1980, sales of 1980 models continued into 1981 and beyond. 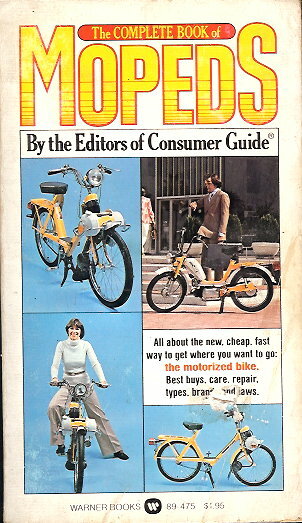 The Motorcyclist Magazine 1981 Buyers Guide http://www.myronsmopeds.com/category/1981-buyers-guide/ lists several “1981” Sachs models: Sundancer $665, Suburban $740, Prima $793, Seville $892, Prima G3 $993 est. 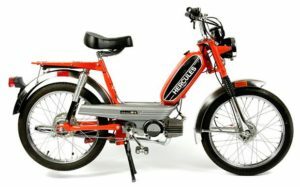 Bike maker Nürnberger Hercules-Werke stopped supplying bikes to the US after 1982. But engine maker Fichtel & Sachs continued to make engines for Columbia (USA), KKM (USA), Sparta (Netherlands), Jui Li (Taiwan), Her Chee (Taiwan). 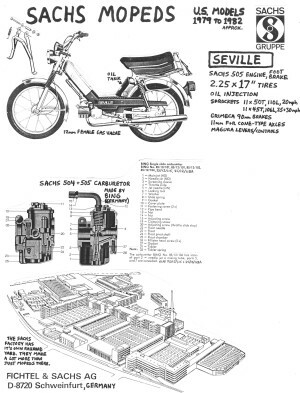 The bike makers had Fichtel & Sachs engine parts and service manuals. The last US-model with an actual Sachs 505/1D engine is a KKM Mopet, 1988 to 1990, made in Ohio USA. 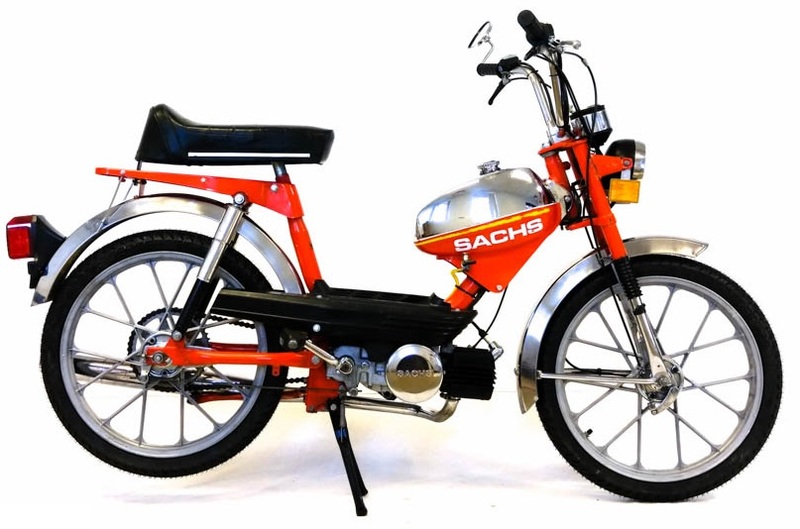 So the Sachs engines lasted 8 years longer than the Hercules-Sachs bikes, in the USA. The rise in popularity of well-made low-cost 50 or 80cc Japanese scooters like Honda Spree, Elite and Yamaha Razz, Riva plus the increased regulations for drivers licenses, registration, plus the lower price of gasoline, contributed to the last Sachs-Hercules moped shipped from Germany to the USA, in 1982, and the last Sachs moped engine shipped from Germany to USA in 1990. 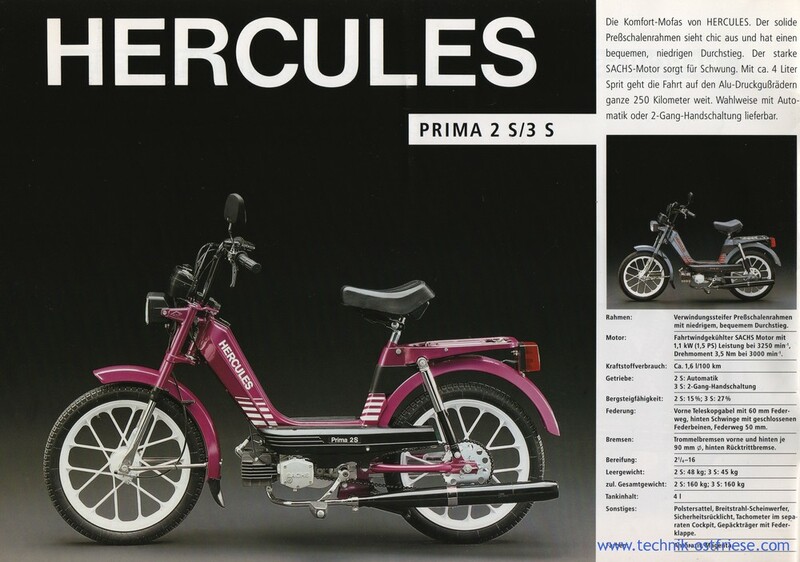 The 1990’s: Hercules continued making the same sheet-frame and tube-frame type mopeds, for sale in Europe, until 2006. 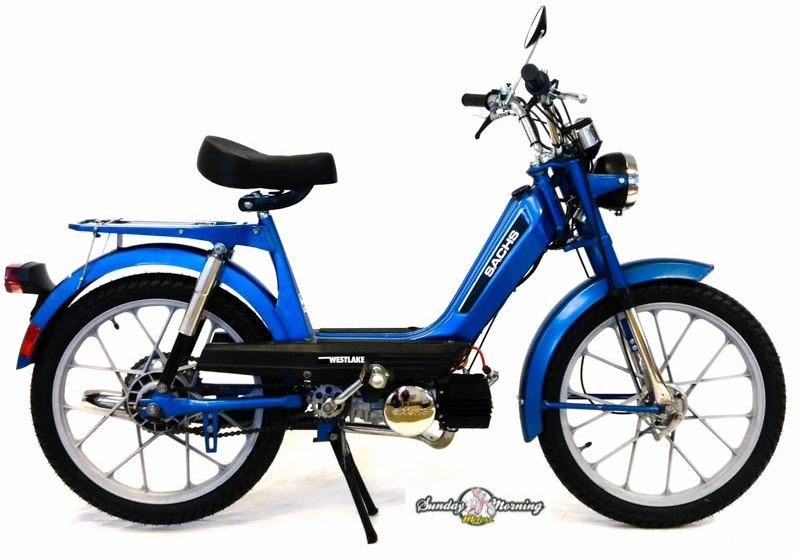 The 2000’s: New clean air regulations came out in 2006 for 50cc bikes, in many places worldwide. That caused many 50cc two-stroke engines to be discontinued. 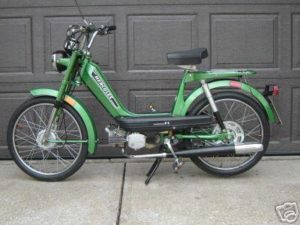 A few years before that, in 2002 Handy Bikes in Columbus Ohio, considered importing a model like the 2002 Hercules Prima 5S, but with a 1-speed automatic Sachs 505/1D engine, side reflectors, brake light, and turn signals. 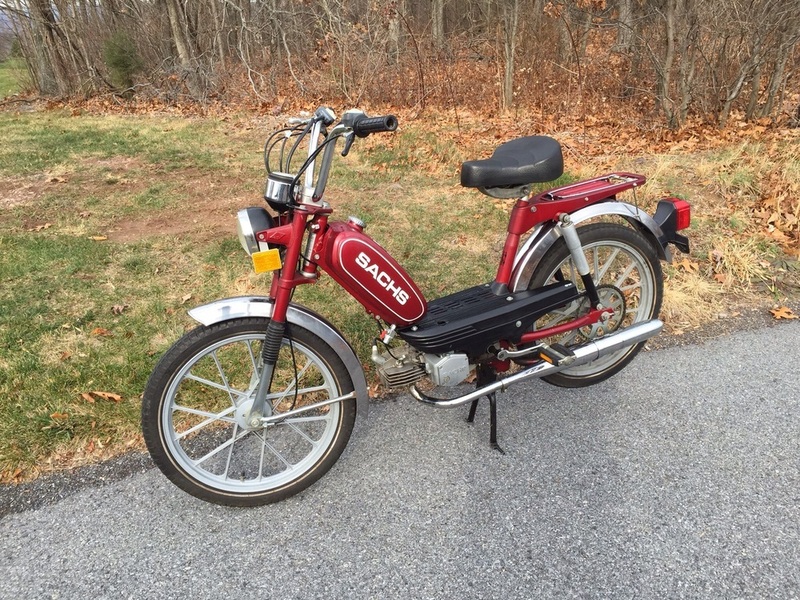 It would have been called “Sachs Suburban” just like 1980. But the cost was too much. 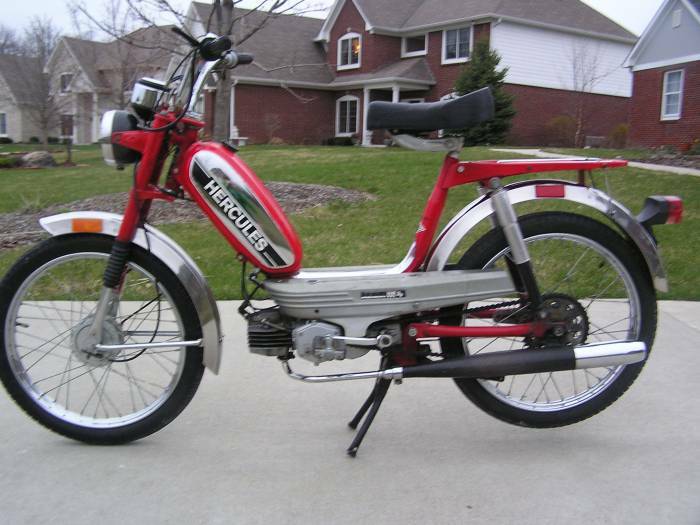 It would have sold in 2003 for $1800, comparable to a 2003 Tomos for $1050 or $1200. For Hercules mopeds, made from 1975 to 1980, that sold new in the USA, here are the things that determine the speed version: cylinder-and-crankcase, exhaust header pipe, intake pipe, carburetor, air filter cover, and rear sprocket. How to tell: The cylinder says “25km” or “45km”. The cylinder head fins are either slanted (A,B) or straight (D). The exhaust front pipe is thick or thin. 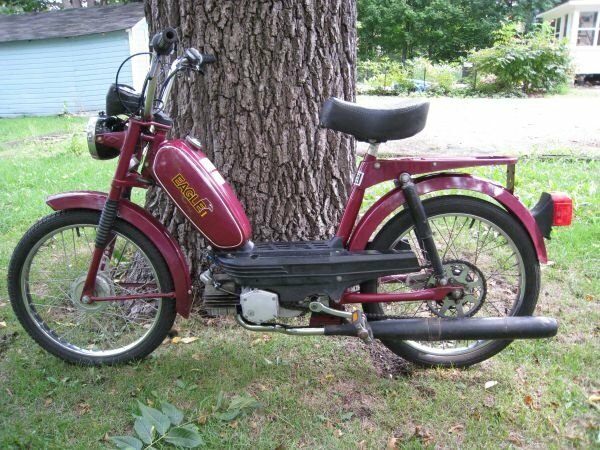 The carburetor says “85/10…” or 85/12…”. The air filter inlet hole is big or small. The rear sprocket is big or small. 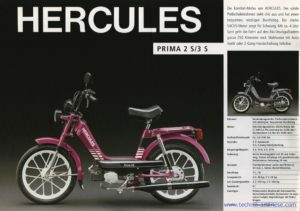 Find the model row in the table that has the same sizes and ID numbers, to determine what speed version your Hercules moped is. This information was not easily available. Sources are all factory manuals, parts, service, and owners. You are currently browsing the archives for the Hercules Parts category.